Yorkshire’s east coast is unsurpassed for the combination of moorland and beaches that are on the doorstep, and Gowland Farm Cottages is set in the heart of these wonderful natural resources. Combine these with the variety of historical and arts attractions and you are all set for a superb holiday. Explore and enjoy the extensive sandy beaches of Filey and Scarborough’s South Bay as visitors have done since Victorian times. 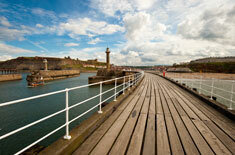 The working harbours in Scarborough and Whitby enable you to sample the fresh seafood on offer. 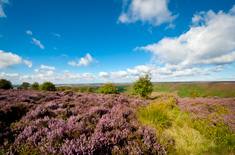 You will not tire of walking and cycling in the surrounding countryside and we are ideally placed for the North York Moors National Park. This area is rich in history, all of the following are a mere day-trip from Gowland Farm Cottages – The North York Moors Railway, Eden Camp (World War II camp), Goathland (location for filming of Heartbeat) and the city of York with its Minster, city walls and the National Railway Museum. Scarborough has several theatres, notably at the Victorian Spa Complex situated on the South Bay. Throughout the summer the Scarborough Spa Orchestra performs 10 concerts per week, enjoy concerts given by this fully professional orchestra in the Spa Suncourt or Grand Hall. Alan Ayckbourne’s Stephen Joseph Theatre is the venue for productions of his work and that of a range of playwrights. 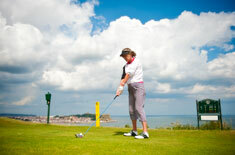 There are a range of golf courses in the area as well as motor cycle racing events held at Oliver's Mount in Scarborough. Scarborough has it's own Rugby Club with gym and leisure facilities. There are also a variety of indoor and outdoor bowling venues in the area. We are proud to sponsor our local football team Scarborough Athletic.